MovieScore Media releases the heart-pounding action score from The Human Race, the new survival action thriller written and directed by Paul Hough, produced by John Hough (Escape to Witch Mountain). The story takes place in a dystopian world where 80 random people are ripped from their average life and are entered into a Battle Royale / Hunger Games style race where the rules are very simple. If you are lapped twice, you will die. Do not step on the grass, or you will die. 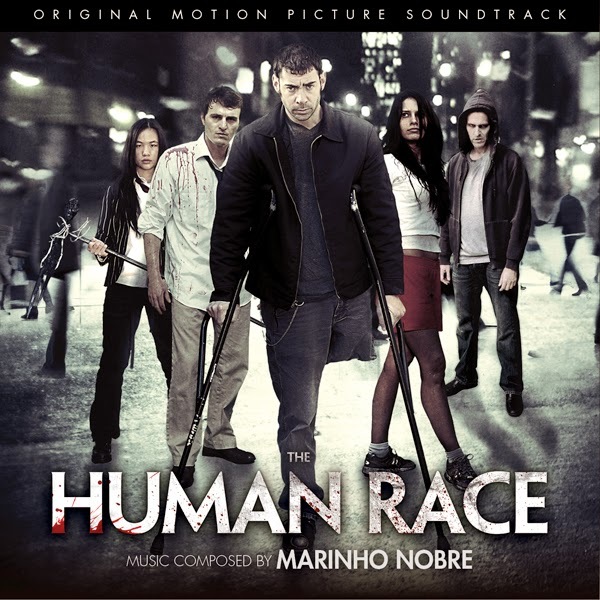 Race or die… Shot over a period of four years, Hough’s The Human Race has been gaining a small cult following since its early premieres at various film festivals and MovieScore Media is honored to join the race with the soundtrack release of the score. Born in Sao Paolo, Brazil in 1964, composer Marinho Nobre moved to New York in 1984 to study composition at The Juilliard School with Conrad Cummings and orchestral conducting with Vincent La Selva (founder of the New York City Grand Opera). He studied film and television scoring with Jeff MacDonald (CSI:NY, Entourage) and orchestration with Steven Scott Smalley (Batman, Mission: Impossible). His recent scoring credits include the Afghani-American coming of age tale Al Qarem (2006), the Latino ghost story Sacred Game (2009) and the Canadian slasher Left for Dead (2007). Apart from scoring, Marinho also released an album of his solo works entitled World Traveler which was inspired by his trip to other countries and the musical influences he encountered there.